As ’80s rockers Europe like to remind us, It’s the Final Countdown. Dah na na. Yes friends, it’s only five weeks to Christmas Day, but with November being the new December and all, that means Christmas is practically next week. Now I don’t know if it’s the same in your circles, but around these parts, nearly all our end of year slash Christmas do’s are done and dusted by mid December which is why I feel like I need to get sorted ASAP. In the short term, that means sorting the Kris Kringle situation. Now I do love the reconnaissance involved in finding the perfect gift and I confess that I do approach the KK challenge with enthusiasm. Well I reckon you can find a thoughtful gift at any price point. Hit me up with a budget and I’ll find you something fab. In fact, the more modest the budget, the bigger the challenge. 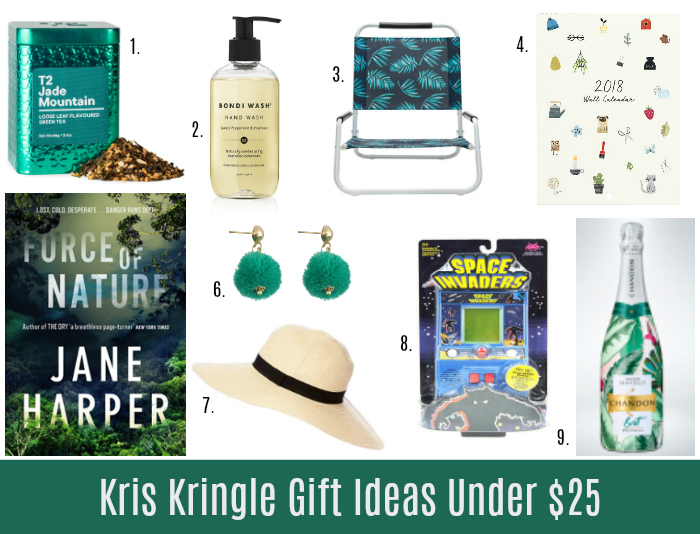 So if you too have a work/family/friend Kris Kringle situation approaching, a limited budget and you’re looking for some fresh ideas, you’ll find everything you need in this bumper Kris Kringle gift giving guide in today’s post. As usual, I’ve tried to cover all conceivable scenarios, interests and budgets so you’ll find the perfect KK for your gift recipient, whether you’re buying for the office clown, your BFF, the boss, or your brother/father/sister/mother in law. ABOVE: 1. Water Blaster, $8 from Kmart; 2. Footsies, $12.95 from Gorman; 3. Desktop Punching Bag, $15 from Kmart; 4. Striped Pot, $12 from Kmart; 5. Goggles, $14.95 from Speedo; 6. Watermelon Harmonica, $12.95 from Sunnylife; 7. Red Stripe Shopper, $14.95 from Project Ten; 8. Candle, $14.95 from Kikki K; 9. Chocolate Freckle, $12.95 from Country Road; 10. The Handmaid’s Tale, $14.99 from Dymocks. If you’ve got a higher budget or more splash to cash, the following gifts cover everything from beach and pool fun, accessories, organisation and a bit of everyday luxe. ABOVE: 1. Jade Mountain Tea, $25 from T2; 2. Small Hand Wash, $20 from Bondi Wash; 3. Beach Chair, $12 from Kmart; 4. Wall Calendar, $16.95 from Kikki K; 5. Force of Nature by Jane Harper, $24.99 from Dymocks; 6. Teal Pom Pom Earrings, $22 from Ruby Olive; 7. Hat, $24.95 from Dotti; 8. Space Invaders Arcade Game, $20 from Kmart; 9. Chandon Seafolly Limited Edition Brut, $18 from Dan Murphy. If you participate in a bigger budget family or friend Kris Kringle and you’re looking for some ideas of what to buy someone else – or suggest as ideas for yourself – below might be a good place to start. The gift ideas below range from the practical through to the beautiful and the fun. ABOVE: 1. Liquorice Backpack, $49 from Gorman; 2. Cards Against Humanity, $35 from Readings; 3. Underwater Camera, $26.95 from Sunnylife; 4. Ombre Tassel Earrings, $40 from Elk Accessories; 5. Leather 2018 Diary, $39.99 from Kikki K; 6. Salad Servers, $35.00 from Hunting for George; 7. Limited Edition Christmas Pudding Candle, $46.95 from Peter Alexander; 8. Bee Green Wraps, $29.95 from Birdsnest. There are a surprising number of great gift options under $15. To the above list I’d add succulents, pot plants, herbs, garden pots and vases and other homewares from places like Bunnings, IKEA and Kmart and stationery from TYPO, Kikki K and Kmart. Project Ten’s range of pouches are unreal for the beach or pool too, as you can stash your phone, book and keys in them while you swim. They’re under $10 and you can shop them here. If your gift recipient is renovating or likes home wares, head to Kmart, Target, Freedom or Typo. Timber photo frames, vases, plants (herbs, succulents, indoor varieties), a candle or even handmade soap can be well received too. If you are buying for a book lover, there are loads of great books to choose from. 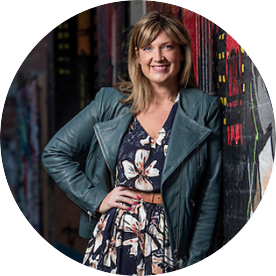 (You can catch up with all my book reviews here if you’re after some inspo). Penguin classics are always a great budget option too. Mags like The Big Issue, The Lunch Lady or Frankie or even a subscription if your budget allows could be winners too. For those who don’t mind the occasional cold alcoholic beverage or spend a lot of time outdoors, a bottle of bubbles or a six pack of craft beer might be a good option or, for a gift that lasts, perhaps consider a champagne or wine stopper, beer making kit, wine/beer cooler sleeve or stubby holder or an insulated cooler or tote. For people who love to spend their summer at the beach or by the pool, a beach chair, sun lounge, or an inflatable pool toy are fun. Beach cricket sets, eskys or a beach umbrella are good options too. Fashionistas might like a new pair of earrings, a bangle, bracelet or a shopping tote. (I’ve included some great options above). Even Gorman has fun socks and accessories which will give you change from a fifty. There are loads of well priced beauty products at Sephora too. Sporty types might appreciate some new golf balls, a frisbee, beach soccer ball or even a new pair of goggles. Again, discount department stores are the way to go here if you’re on a budget or check out Rebel or Speedo. Geeky types might like a Nanoblock set or a tech accessory. Foodies might appreciate some fresh inspo with the Christmas edition of Donna Hay, Gourmet Traveller, Women’s Weekly or Taste magazine paired with some gourmet chocolate or other sweet treat. I always love a new cook book for summer or something fun for entertaining with summer BBQS, NYE and Australia Day gatherings on the horizon. I’ve got my eye on this fun Cocktail Party Kit, $35.95 from Sunnylife and the gorgeous Neighbourhood, $39.99 by Hetty McKinnon. I’d never say no to a block of Fromager D’affinois brie either. Add a beautiful cheese knife and crackers for DIY Cheese Heaven. If you don’t know who you are buying for and want something useful but middle of the road, stationery (diaries, calendars, weekly planners, To Do Lists, journals, a nice pen or desk accessory etc) can be a safe option. Kikki K, Typo and The Notemaker have great options. Some other ideas for the difficult to buy for could include a movie voucher, iTunes voucher or voucher to their favourite cafe, restaurant or coffee spot. Some recipients may also prefer a recycled, upcycled or hand/home made gift so suss this out when you do your crafty reconnaissance. And of course, don’t forget the less fortunate this Christmas. There are loads of great organisations and charities doing awesome work supporting people in communities locally and overseas. 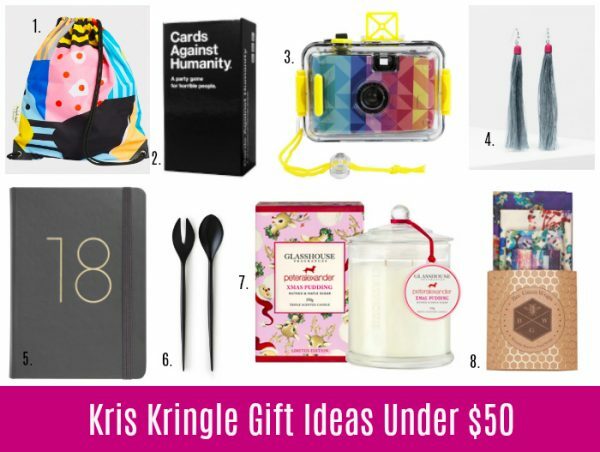 Even by just spending $5 less on your main Kris Kringle gift, you can add a donation or a really useful gift to meet the budget and do something for someone else this Christmas. If this is important to you too, make sure you give your KK gift giver the heads up. I like to give a really useful gift from TEAR, such as preschool classes for $5 to the kids’ teachers and other gifts to our family and friends. I request these as part of my Christmas gift too. I love that there are gifts for all budgets across education, health and community support. 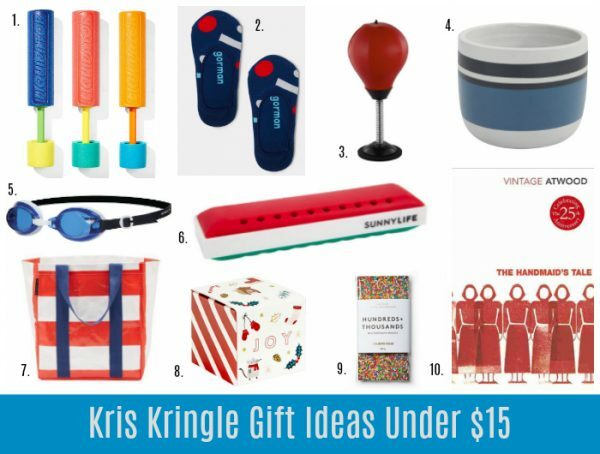 What’s your budget for Kris Kringle this year? Who are you buying for and what’s your go-to gift?